Geometry in first grade is a hands-on affair. 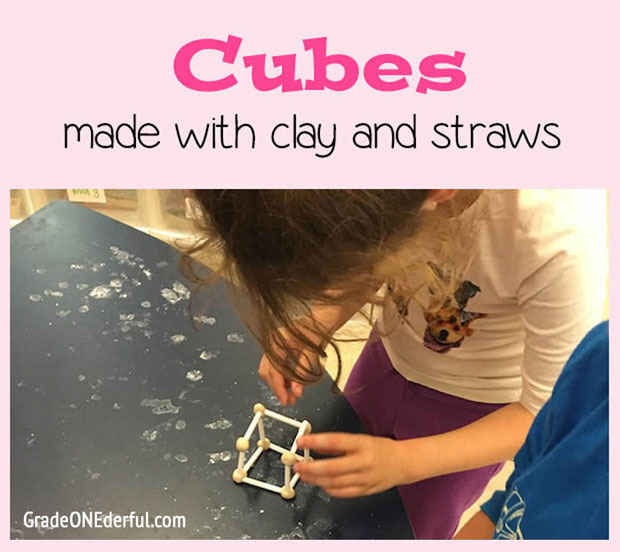 And today it was a little muckier than usual because we made cubes using clay and straws. I used a sharpie to mark off 5, 10, and 15 cm on the straw. I only had to mark one straw and then I could hold four straws together and cut them all at once. I gave the kids some air-drying clay and they went to work rolling out 8 little balls. It worked out best if they built the base first. And then added the sides. The top was the trickiest but most kids managed just fine. In past years we've made cubes with toothpicks and marshmallows, but this worked WAY better. It was just much sturdier to work with and once the clay hardens it's easy for the kids to take them home in one piece. UPDATE: Okay, I lied! Not on purpose of course! But it turns out that lots of the kids had difficulties getting their cubes home without breaking them. Sigh :( They seemed sturdy to me ... but not so much for 6 and 7-year-olds. SOO...next time I'll use plasticene. Or even better, I'll try toothpicks and gumdrops like Lori suggested. Ah well ... live and learn. Kids love to create! I like these cubes. I've also seen them made with toothpicks and gumdrop candies. I really liked the non-food idea. :( that it did not transport well. But then, marshmallow or gum drop creations would not make it home with my kids either. Agreed:) If they don't break 'em, they eat 'em!